There's some things, in terms of theme park music, that you can pretty much rely on. The specifics may shift, but they're always gonna be playing Japanese-sounding music at the Japan Pavilion in EPCOT. Main Street USA has always had its gay nineties waltzes. They're always gonna have movie music playing on Hollywood Boulevard. These are easy things to guess. But wait. What does "the future" sound like? That's a moving target. If you asked somebody in the late 1950s they may have given you an orchestral score laced with theremin music. In the 70s it may have been experimental Moog synthesizers, and in the 90s it could have been ominous, New Age-inflected atmospheric tones. When I first began my work gathering up theme park music, the musical history of Tomorrowland was a total blank slate. 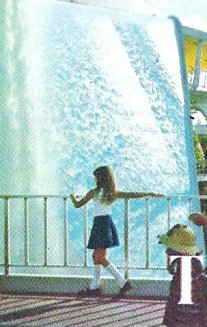 There's a track that's well known to park goers because it played all through the 1990s during the age of the "New Tomorrowland"; it's well known for including the classic park anthems "Bubble Shuffle" and "Behind the Waterfall". 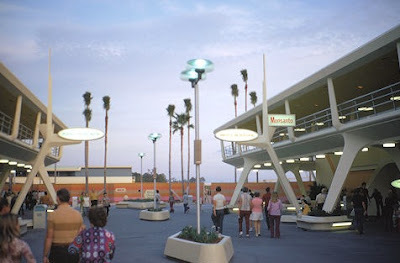 Many a young sci-fi nerd made indelible memories listening to Bubble Shuffle while cruising past the Tomorrowland Speedway in the TTA car, and perhaps also noticed the same tracks playing at Wonders of Life and Fountain View Espresso at Epcot. Behind the Waterfall by David Lantz is one of the few immortal Disney tunes not written expressly for the company, joining Baroque Hoedown in an exclusive club. The Disney internet was still too small to mourn the passing of the "Bubble Shuffle" New Age loop in fall 2003, when it was replaced with the music which as of this writing currently plays in Tomorrowland. Made up of classic Tomorrowland music cues like "Miracles From Molecules" and arranged in a pleasingly spacey style by composer Dan Foliart, it also currently plays in Tokyo Disneyland, Disneyland, and Hong Kong Disneyland. But that was where the knowledge ran out. If you wanted to know what played in Tomorrowland before the "New Age" loop, you were out of luck. So it's with a measure of pride that I can present this early musical history of the area to you. It's been a long time coming. It actually took a good amount of work to confirm that there was any music playing in Tomorrowland to begin with. As I've covered in this blog before, many areas of Disneyland did not (and still don't) have formal area loops. Jack Wagner was hired to provide the park background music in 1970, but the west coast Tomorrowland did not receive a full area loop until 2005 - and it was the Dan Foliart loop. Nobody I talked to could remember far enough back, and good luck finding somebody who thought to bring a tape recorder to Magic Kingdom and do some documentation back in 1973. See those tall, brown speakers bolted to the central light columns? Disney wouldn't bother to run audio cable underground and up through a light pole for no reason. Something had to be playing, or at least was supposed to be playing, even if nobody really noticed it. I heard all of the theories. Some thought the original Tomorrowland loop was music from Kaleidoscopic Vibrations: Electronic Pop Music From Way Out, which was the Perrey and Kingsley record which Baroque Hoedown was originally released on in 1967. This had some appealing logic to it, but then of course nothing much on the album sounds very "spacey", Baroque Hoedown included. Did Disney really have an electronic version of The Umbrellas of Cherbourg playing in Tomorrowland? One former Cast Member claimed that the early area music was the entirety of Wendy Carlos' Switched-On Bach, which is such a specific memory that I still think this famous and recognizable record could have played in one of the area shops, which had their own music sound systems. But this seemed to get me no closer to the area music. Thankfully, Mike Cozart had been in touch with Jack Wagner before he died about the early Magic Kingdom area music and had ended up with some materials Jack had compiled for his own records of his work for Disney. As it turned out, Mike not only had Jack's list but had already identified the source music for a few of the tracks! As it turned out, the tracks that Mike had were from the Capitol Media Music line. 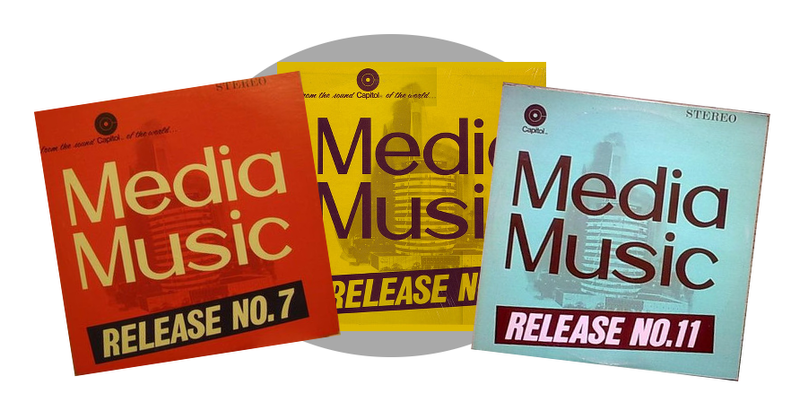 Media Music was a line of production music releases produced by Ole Georg and released through Capitol, where Wagner already had contacts. Production music LPs are a fascinating subset of music releases, in that they are intended to be licensed on an individual album or track basis and used for things like television commercials and radio station segments. Many filmmakers who cannot afford to hire composers use production or library cues to fill out their films. This was a frequent practice of George Romero who filled out the entirety of Night of the Living Dead with library cues. Probably the most widely seen film to make heavy use of library music is Monty Python and the Holy Grail, where the tinned, slightly cliche quality of the library tracks add to the comedy of that film. The Capitol Media Music releases themselves are still the gold standard for library music, and they're extremely evocative. All of the goofily retro music heard in Ren and Stimpy came from Ole Georg's back catalog, and the tracks are still in use today by any production wanting to evoke a vintage atmosphere. And, perhaps unsurprisingly, Jack Wagner used the Media Music releases to create a handful of the most evocative psuedo-futuristic area tracks ever created. None of this makes it any easier to actually figure out the Capitol Media Music line, however. 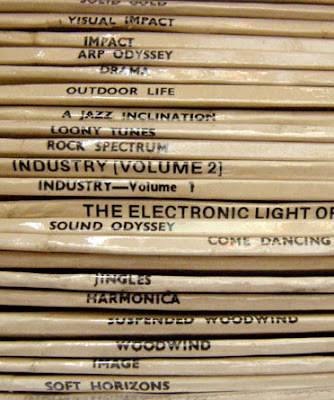 Each piece of the Media Music library was sorted into "Releases", which were numbered. There could be two or three "Releases" a year - say Release No. 5, Release No. 6, and Release No. 7. Within each "Release" would be twelve to fifteen individual albums, each grouped to a theme. Capitol sold these to production houses as entire "Releases", in which case the purchaser would receive the full raft of fifteen LPs. They also loaned each disc out individually, and would require the discs to be returned upon completion of the order. In other words, if you're looking for a specific track from the Media Music library, you need to remember a lot of easily confused data: the "Release" set, the individually numbered record from the Release, and the name of the track. This is why, when I finally get to listing the music here, you're going to be seeing things like "Capitol Media Music Release 12 Number 6". To make things even stickier, these same pieces of music were released at least three times more. Some of them reappeared in the "Hi-Q" 45 RPM series, with new and different releases interspersed. Then, the new Capitol production music line in the 1970s - "The Professional" - included the original Media Music tracks with yet more updated tracks and styles. And Ole Georg himself is now selling rights to some of, but not all of, the tracks through CDs. Okay, so that's where the music came from. Now the trick was to figure out how to get it. Thankfully Jack's document included the run times of each track, so matching the track to the release had an additional check on authenticity. Thankfully, I also at the time was living in Los Angeles, which is the best place in the country to find old production library LPs because as the production houses closed or moved to newer sound formats they sold off their old records. So with help from Michael Sweeney, C33, Mike Cozart, and me driving around in my car, I can finally allow you to read, and hear, the earliest Tomorrowland music. This is dated March 1972, and it's likely that there was simply no music in Tomorrowland for its first few months. Please note that the loop is incomplete; the bottom of the list indicates that it's continued on a second page which is now lost. I believe that the loop is missing only one track. It comes out to a running time of about 38:30, which is just enough time to include one of the many tracks on the Environment/Ecology or National Parks releases. This would bring the run time up to an even 40:00, which is the average length of many of the original Walt Disney World loops (Caribbean Plaza, Frontierland, probably Main Street, etc). Regardless this must be regarded as and will always be a partial playlist - although the tape master still exists, it has decayed beyond the point of usability. It's a unique loop. 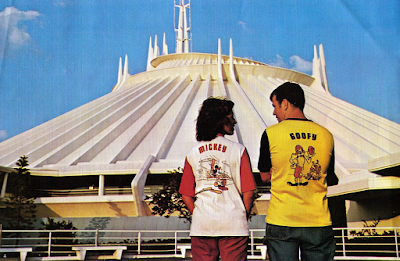 Wagner took his cue from the majestic architecture of the area and crafted a loop of grand, sweeping music not too far off from the sort of music which would play ten years later outside EPCOT Center. 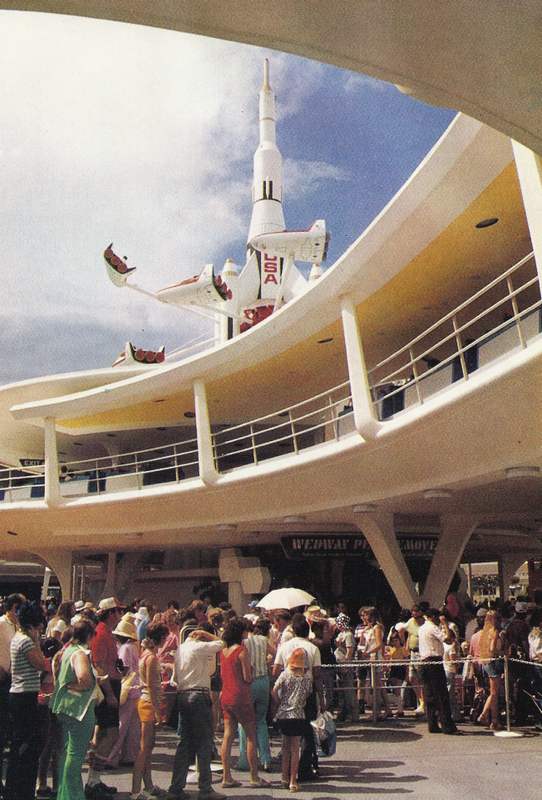 Now, in researching this loop I watched home videos, listened to live recordings, and spoke to everybody in a position to possibly remember, and everybody tells me that the main sound heard in Tomorrowland that they can remember is the echoed music coming from the Peoplemover. My best guess is that the 1972 loop would have been audible through the summer of 1975, when the WEDway came online. It's clear that once those blue cars started rolling, that whatever music was intended to play down on the street level was drowned out totally, and Disney may have turned the 1972 "Concourse" music way down at that time, or even removed it. The WEDway music became the defacto music of Tomorrowland. When the ride opened in Summer 1975, it used a Jack Wagner created the Peoplemover loop with music from Capitol Media Music. Disneyland's Peoplemover got a similar treatment in 1976, and those tracks have been floating around online for years in various forms. Finding the correct tracks and moreover track names for the east coast park was trickier, and Michael Sweeney and I pretty much ended up buying every Media Music LP we suspected could have a match. As it turns out, a track which had previously been identified as "Outdoor Life #1" is actually "Outdoor Life #2" and was re-named when Ole Georg released the tracks to CD in the late 1980s. Our list uses the track names for the original LP releases. The WEDway continued to use this loop until it closed in 1993 to make way for the "New Tomorrowland". As part of the conversion to New Tomorrowland, the WEDway speakers were taken off their unique loop and changed so that they played the same music heard in the rest of Tomorrowland, and it has remained that way ever since. Capitol Media Music Release 7 Number 8 "Outdoor Life / Supersoundic Strings"
 Capitol Media Music Release 8 Number 5 "Industry in Motion"
 Capitol Media Music Release 8 Number 7 "Neutral Strings in Motion"
1983 saw Tomorrowland's first big image make-over, and with it came a new loop and the era of "New Age" Tomorrowland began, but that's a story for another time. Perhaps our next post? Love your blog. Thanks so much for this timeless gem!!! Excellent work! Even people who understand the point of collecting theme park ride soundtracks often don't get why we would go for the background music loops as well...especially old obsolete loops that we ourselves never heard. But archival is a worthy pursuit in itself, and we can examine the choices made in assembling these loops and get a sense of the atmosphere the designers were going for at the time, and use that knowledge when creating our own "themed experiences" like parties or pleasant work environments. People often underestimate just how much well-chosen instrumental music contributes to an atmosphere. These tracks take me back to my childhood. Not so much the specific music for these areas (I didn't reach DL until '73 and WDW until '81) but more the feel of the '60s and '70s. (I was born in '62). Thank you for a pleasant trip back on a Sunday morning! I Love the Work. The Same Tracks Also Play at Disneyland's Autopia Background Music. Thank you for putting this music loop together, it was always one of my favorites in the Magic Kingdom. But you have "The Monorail Song" attributed to George Bruns and on all recordings I have officially released by Disney, it lists the composer as Buddy Baker. I've always felt the 2003 Dan Foliart loop has its own mysteries still to be explored. For one, while the Foliart music may play at Disneyland, Magic Kingdom, Tokyo Disneyland and Hong Kong Disneyland, each park has a different set of tracks. The intent seems to have been to give each version of Tomorrowland a few tracks unique to that particular park, but it's all mixed up. "Miracles from Molecules" plays at the Magic Kingdom (the olf Disney Music Loops site had that particular track listed as "Miracles from Molecules/Seize the Future Medley; I don't hear it but wouldn't that be confusing! ), and "Now is the Time" and "If You Had Wings" play at Disneyland; Tokyo Disneyland's loop contains arrangements of the themes from BOTH the US and Paris/Tokyo versions of From Time to Time/Timekeeper. The 2006 official albums for Disneyland and Walt Disney World contained a Foliart track, entitled "Welcome to Tomorrowland," that has never played at Disneyland or Walt Disney World, but DOES play in the Tokyo loop. Disneyland's loop does have an arrangement of The Monorail Song which I believe is exclusive to that park, and makes good sense. And Tokyo got an arrangement of the Tron theme which I'm surprised didn't make the cut in the US loops. Then of course, beyond all the recognizable themes, there are a bunch of original compositions (the aforementioned "Welcome to Tomorrowland" being amongst them) the titles of which we do not know. However, Foliart did register titles for each of the original compositions with ASCAP, leading to many debates over which title corresponds to which track. It's a goal of mine to some day ask Dan Foliart what the actual titles are, although that's gonna be tricky unless it's him and I sitting down with an iPod going through them one by one! In brief, I find it a little surprising that Disney actually had Foliart compose/arrange much more music than was needed for an hour long loop, and then went and made 3 or 4 different versions of the same loop all with different tracks. It certainly seems as if the intent was to have a base loop with site-specific melodies added in for each park, but that doesn't really seem to have panned out. You are crazy...but in a good way. Or maybe tenacious is a better word. Either way, thanks for all of your work hunting these music tracks down & assembling them together for us to experience the MK of the past. I just can't stop listening to these loops. Thank you for putting them together. I always look forward to new posts on your blog. In regards to the variations of the music recorded for use in the various Tomorrowland (s)in 2003 by Foliart: often base recordings are done and a COPY MASTER is sent to each park and the sound rooms at each park may pick their own selections and create the PLAYBACK reel, sound carte, disc , file or whatever the going technology is at the time. A good example of this is the COPY MASTERS for "RIVERBOATS" : it contained about 6 tracks -Disneyland used only 3 of the tracks for the MARK TWAIN while Walt Disney World used most or all of the tracks(off hand I cannot recall)for the surviving RICHARD F IRVINE Riverboat. Same reason why Disneyland's Fantasyland SKYWAY CHALET load music was slightly different than WDW's --Jack Wagner had set up The Big D Sound Studio at WDW and would sometimes create a Base Master -then a COPY MASTER for Disneyland - since he lived here in California --and then sent a BASE COPY to Florida where the sound room technician might create their own PLAYBACK COPY to suite whatever playback equipment was being used for their park. This wasn't always the case but often it did happen. Disney's California Adventure SUPERSTAR LIMO also used the PeopleMover tracks as well as countless other Capitol Records Media Music tracks however they were all played slightly sped up. Can't wait to listen restoration of Magic Kingdom Wedway People Mover 1993-2003 music next in this month or next month! Do we know for a fact that Jack Compiled the HISTK playset loop? It fits given the shared tracks, but from what I've seen all of the original MGM loops were compiled by Russel Brower. Or course HISTK didn't open until later. That second set sounds like Buddy Baker's Peoplemover Tracks. Ive got a bunch of these tracks, but I don't know the correlation between the tracks and their names... any chance we can get durations with the lists too? Thank you so much for this! After reading this I've began hunting down some of the Capitol Media Music records starting with a copy of the Dan Kirsten "World of Progress" record that quite a few of these tracks are on. I cannot tell you how much I appreciate the effort you've put into this. If you find any of these records, please share them - I've been wanting to reconstruct a source quality version of the '72 loop for a long time!